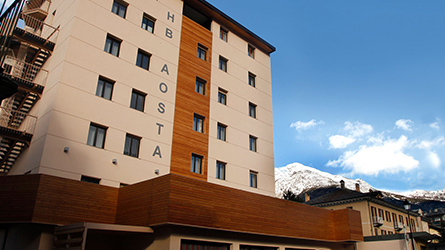 The 3* superior HB Aosta boasts an array of swanky, modern, stylish rooms all with minibar, safe and satellite TV. North facing rooms offer views over the Gran San Bernardo valley, while south facing rooms provide views over the old town and a wonderful Pila panorama. 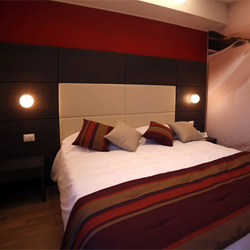 Situated in a quiet street just off the main pedestrianised area which runs through the centre of Aosta, the hotel is just a pleasant 700 metre walk to our Aosta office and the gondola. 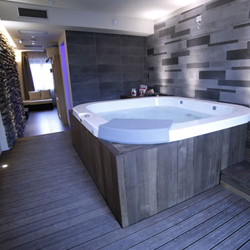 And, after a hard day's riding, the hotel's spa area proves popular before a relaxing drink at the bar and an evening meal sampling Aosta Valley cuisine. Situated in a quiet street in the centre of Aosta, it gives you easy access to both the town and it's only a short walk to the gondola. The HB Aosta boasts a clean and modern interior, with a service to match. 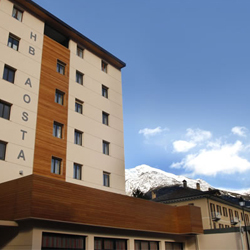 Below you will find prices from for the HB Aosta for 3 days, 5 days and 7 days. If you require any different length of break then please state in the Enquiry form at the bottom of the page. The HB hotel was fantastic. I have stayed in a lot of accommodation over the years and I certainly wasn't expecting the outstanding level of comfort and service I received whilst I was there. The hotel staff were very welcoming and hospitable, they constantly went out of their way to make my stay the best it could be. Just register your interest by filling out this form and we will aim to reply within 24 hours. Your details have been sent to one of our team who will contact you with a response to your website enquiry. In the meantime, please feel free to contact us on either 01623 272711 or by email to gobiking@alpinerevolution.co.uk. Alpine Revolution is based in the Aosta Valley, offering Mountain biking and Road Cycling, guided and non guided tours.